Leftover grub, a food truck and zero knowledge of the catering business – for many, this may sound like the beginning of a joke. However, not for Chris Rai and his wife Andrea, who made a solid business out of their Chapati Man food truck. Having already recruited its master franchise in Sri Lanka, the franchisor is now on track to expand across Asia as well and wants to launch franchises in every major UK city. But with Rai having a career working for the government and his wife being a textile designer, launching their own business wasn’t a priority. At least, not until Rai’s colleagues complimented him on the Indian wraps he brought to lunch, which sparked a new business idea. “I used to take leftover curry in a chapati to work and [my] colleagues used to say ‘oh that looks really nice’ and it all stemmed from there,” explains Rai. It all started when Rai’s parents brought over their knowledge of spices and cooking experience to England in 1960. “I was taught to cook quality Indian food by my mum from a very young age,” Rai recalls. Using his mum’s culinary knowledge, he started working on a business plan with his wife. Not long after in 2007, Chapati Man was born and was set to take over UK festivals in a colourful food truck. “I always wanted to run my own business but we had no idea of the catering trade,” he adds. However, he did possess the passion and drive to make the future of this business a bright one. Encouraged to make the Chapati Man story a successful one, the husband and wife team worked long hours to make their dream come true. “During the first year, we continued to work in our full time jobs whilst running the business,” Rai explains. “We’d come back from a festival on a Sunday night at [3 or 4am] and would be up for work again at seven o’clock that morning.” Although it was hard work, it kept a steady cashflow coming into their business. 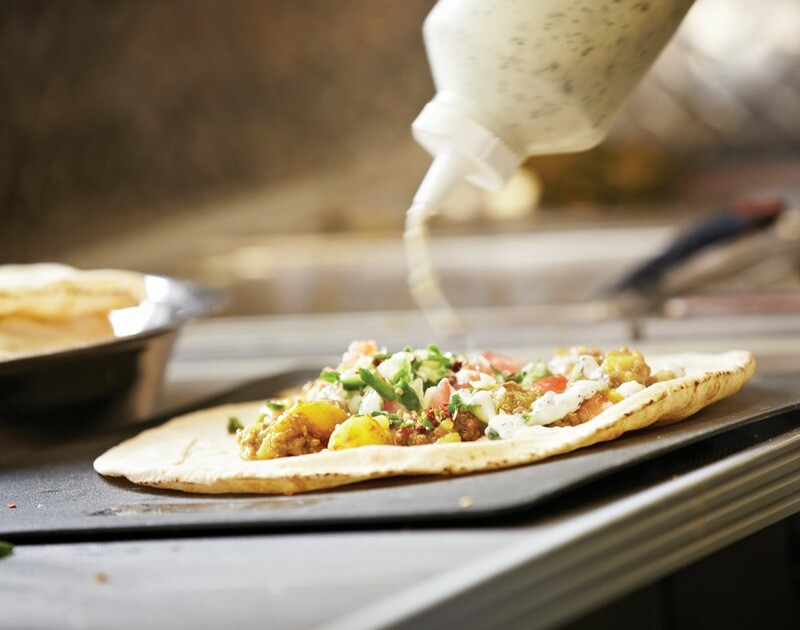 Luckily, the duo managed to do it all on their own and eventually invested in a bespoke catering trailer and the equipment needed to hit the roads with their original curry in a wrap. “We started doing all the big music festivals around the UK like Bestival, Camp Bestival, Lovebox Weekender [and] big sports events like the British Grand Prix,” Rai remembers. These efforts certainly paid off with Chapati Man being voted the number one food caterer in its first year at the Glastonbury festival in 2017. “There are over 350 catering trailers down there so we must be doing something right,” Rai ponders. This was a big achievement for the new brand which got to cater at the festival in its debut year. Normally, newly launched businesses don’t make the cut for quite some time. The wraps also managed to hit the right spot. “Our chicken saag wrap won sandwich designer of the year award back in 2011,” says Rai. The couple also familiarised people with the brand by landing huge deals with supermarkets that started adding these Indian wraps to the shelves. “Our wraps are being sold in Morrisons across [more than 400] stores and we also managed to get our Indian snacking products into Waitrose, which is a big achievement,” says Rai. For a young brand, this was a great way to get the exposure it needed. The popularity of the brand grew rapidly as they noticed there was more demand than they could handle. With only one food truck and a lot more hungry people, franchising was the only way to keep the same quality. Following these achievements, Rai began to work on getting the franchise model together when the idea was proposed by experts in the field. “I was approached by a franchising company about 18 months [ago] and they [told] me that they thought our brand and concept could be really good for franchising and that kind of sped up the process a bit,” Rai explains. However, putting this model together was quite the challenge as the franchisor claims the street food truck concept such as this one had never been attempted in the UK before. At the same time, the pair also ensured the concept could easily be converted into a fixed property. “The franchise is not solely based on food trucks,” says Rai. “A lot of the people are interested in fixed kiosks and shops. The food truck concept adopted by us is a business on wheels but the model is easily transferable into fixed premises.” The duo worked together with the experts for around five months to make sure everything was how they wanted it to be untill they launched it back in the spring of 2018. Luckily, he soon had his chance when he got in touch with someone he met when he visited Sri Lanka with his family. He sent over the franchise ideas he had to the potential franchisee and it didn’t take long before the person gave the concept the thumbs up. And finally, the aspiring franchisor signed up the first franchisee, expanding the brand to Sri Lanka with plans of taking over Asia. “It’s quite ironic that I’m paying for these listings on various different franchise sites and I actually got this contact myself and worked on the deal from scratch,” Rai ponders. With more people believing in his brand, Rai desires to see his franchise roll all over Britain. “We don’t see us having 50, 60 or 70 franchises,” he shrugs. “It doesn’t work like that in our food truck game.” While he’s being careful to find the right franchisees, his aspirations are ambitious to say the least. “The idea is to sell a Chapati Man franchise in every major UK city from Manchester and Birmingham to Leeds and Liverpool,” Rai reveals. He’s also hoping to top this with a master franchise in Europe. While it’s still early days for Chapati Man, it doesn’t hold Rai back from taking the UK by storm. “We have got some more exciting announcements coming up soon,” says Rai. Who knows, you might spot the Chapati Man rocking up to your local high street. Make sure you sink your teeth into its wraps.